You might think they are pretty … but they are INVASIVE WEEDS! The following is a list of these invasive weeds that (in our humble opinion) should NEVER be planted. Unfortunately these are everywhere on the peninsula and people continue to plant them. Beware, they spread like crazy and once planted are hard to eradicate. BROOM are very aggressive, invasive plants. They can be identified by their yellow flowers and bush-like form. French Broom (pictured) was introduced as a garden ornamental and can still be bought in nurseries. 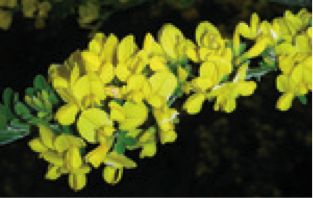 Scotch Broom was introduced as erosion control around 1900. All displace/destroy native shrubs and grasses and are mildly toxic. BroomBusters is a group of volunteers dedicated to eradicating broom from the Tiburon Peninsula. For more information contact Faith Brown (brownsf@aol.com or 415.435.5320).